Double Fine's Brutal Legend was a big game that nonetheless failed to set the world on fire - and between that and the legal wringer of former publisher Activision, it's no wonder that the studio has been seeking success with smaller, downloadable games rather than giant magnum opuses. Last year's Costume Quest was a bite-sized game that was well received for its quirky charm, and Double Fine is hoping to make that lightning strike twice with Stacking. 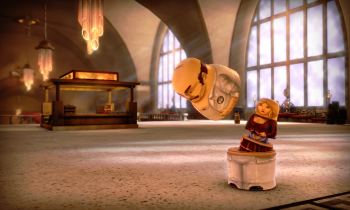 Set in a world populated entirely by Russian matryoshka stacking dolls, Stacking's visual aesthetic is heavily influenced by the era of silent films in the 1930s, creator Tim Schafer said while demoing the game at a THQ event. All of the game's cutscenes - telling the story of young Charlie Blackmore, the littlest stacking doll in his family, who is out to reunite his family and save them from the evil industrialist Baron - are done in the silent film style with dialogue flashing on screen after it's been "spoken." They're also done as stageplays, using props and models to represent, say, a boat traveling to a giant ocean liner. "We were really taken with the idea of dioramas and miniature stages," says Schafer - and it's something you might not notice in the game unless you're looking for it. The locales little Charlie visits are made up of common everyday objects: Early on, he rides the rails on a handcart constructed out of popsicle sticks, and the aforementioned ocean liner has cigars for its smokestacks. Charlie might be the runt of the Blackmore family, but his small size gives him a unique power: He can hop inside a larger matryoshka doll from behind in order to take control of it (don't think about it too much, it's kind of creepy). Every stacking doll has its own special ability: Big angry men can harrumph and clear people out of the way, upper-class ladies can sip tea, and the illusionist can cast a spell on other dolls to cover them in a magic purple argyle pattern. At its core, Stacking is about using these dolls - and Charlie's ability to hop in and out of them - to solve puzzles. The first level set me down in a train station, where Charlie's older brother was being used as a stand-in to shovel coal thanks to a coal workers' strike. It was up to me (er, Charlie) to figure out a way to get the railway leaders down to speak with the strikers to work out a deal. Unfortunately, they were all holed up in a very exclusive club that wouldn't give a working-class boy like Charlie the time of day, let alone admit him entrance.